Today, another scam reached my inbox, my postal mail box, to be precise. A letter by “Corporate Compliance Services” sent me a “Labor Law Compliance Request Form,” notifying me that I am required to pay $84.00 to comply with federal law 92 USC Sec. 999 etc. etc. and so on and so forth. Obviously, they messed with the wrong translator again, because in this case it was nearly immediately clear that this was a scam, as an internet search instantly revealed. Clue number 1: The scammers sent the notice to my home address, not my business address. I use my business address for every single correspondence with all government entities and agencies, except my personal tax return. All business-related correspondence with city, county, and federal agencies as well as my clients goes through my business address. Clue number 2: While the letter looks really elaborate, in the front and in the back, even more official than some correspondence I received e.g. from the IRS, they misspelled the word “address.” No goverment agency misspells a word on an official form. Some individuals might send out misspelled posts on social media, but no form I have ever seen contained such a blatant spelling error. I was tempted to reply to the fake “notice” with a letter instructing them to deduct the fee from my Nigerian bank account, but alas, several deadlines are looming. Plus that would confirm my personal address. Corporate Compliance Services is out of Pembroke Place, FL. The owner is Thomas H. Fred. They use a series of PO Boxes across the country to hide their true identity. They buy lists of new business from states and send the scare tactic letters. The owner has been caught in the past with a similar scam in FL. If you are scammed, you should contact the FL Attorney General. If we all stand against this behavior it will cease. Thank you for publicly posting this information. I also received this notice twice. Like many others, I just received this in the mail. I threw out the form, folded a blank piece of paper, filled it up with some extra fine glitter and mailed it back. To me, it’s worth the stamp. Surprise!!! What a thing! 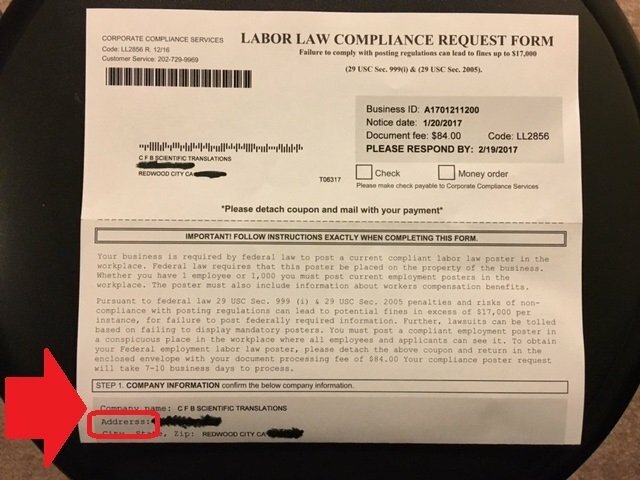 I just received this same Labor law Compliance letter. Almost fell for it. I asked a friend who never received this. Then I thought I should look up the Law itself and I found these scam reports. The trigger was it had no semblance with other gov. correspondence I ever received. I am an idiot that paid this. Is there a way I can still contact them? I know I’m not going to get my money back but I want this POS to go down. If you sent a check and they cashed it not too long ago, your bank may still be able to stop the transfer. Other than reporting them to the authorities, I don’t think there’s anything else you can do. However, this scam has been going on for a while, so I wouldn’t get my hopes up. I just received a same letter, exactly same misspelled the word “address”, I’m feeling a bit strange then I google it. Glad to hear that’s a scam letter, I wouldn’t get bite. We got one also. We didn\’t catch the spelling error. But when we called the customer service number to get their mailing address, we could not get through. Thank you for posting this scam notice. I also just got one. I was going to contact them to say i don’t employ anyone and first i’ve heard of having to pay this. Thankyou for pointing out the spelling error! I have the same error of course its a scam! I am glad I decided to google it. I also received the letter a couple of days ago. Here is detailed information about some of these mailers. I got this in my mail too but I wasn’t smart enough to google it and I didn’t see a spelling error…so I did send them the check and of course, they got the money. Do you know if there is ANYTHING I could do to get my money back?!?! I wouldn’t get my hopes up. If they already cashed the check and the transaction is completed with your bank, chances are, they have already disappeared with the money. However, if the money has not been deducted from your bank account yet, then you should contact your bank ASAP and tell them to put a stop-payment order on the check. You could also report the fraud to the FBI, https://www.fbi.gov/contact-us, but that probably won’t get you your money back. Thanks for the info… I was almost fooled- decided to google it and was shocked to discover this. Thanks a lot I just starte an small business and I got this letter so i’d Goggle it and I found this info. So thanks again. First they called me and then they sent the letter.Fortunately,I always read everything not only did I notice the “addrerss” mistake but I Aldo read the “DISCLAIMER” At the back of the letter. It says clearly they are not approved or endorsed by any agency of the gov. Don’t fall for it!! !